I’ve always been a pro-efficiency kinda gal. The type that walks quickly even when there’s no rush to get anywhere. My darling husband A always makes fun of the fact that I’m “racing” him whenever we’re out for a walk, while I feel like I’m merely sauntering at a leisurely pace. I like ordering my Starbucks coffee by specifying every possible variable I would like in order to minimise the number of questions the barista has to ask me – I even stipulate whether or not I require a receipt. I will group all of my grocery items according to category on the conveyor belt so that the checkout operator can get them packed properly quick fast. So essentially, it would seem apparent that I also like imposing my efficiency on others. Being accompanied by a toddler for approximately 97% of your errands does not make for an efficient use of time. This staggering truth horrified me upon becoming a new mother. While Tuna and I were on one of our playground and supermarket adventures today (I daresay she may have enjoyed the supermarket more than the playground), I realised that I am also trying to impose my need for speed on my toddling little daughter. We left the playground and I needed to pick up a few miscellaneous items (read: cravings for Orange Fanta and saltine crackers – nausea is back for a couple of days it seems, go figure). I didn’t bring the stroller with me because I figured either (a) I could expertly carry her on my hip and/or (b) she could walk. I think baby #2 has hit some kind of growth spurt in the past week, because the waddling has reared its ugly head. I feel like a hippo. A bloated hippo. A pregnant bloated hippo. I thought I was doing pretty well at maintaining the energy and zest of that active pregnant woman who runs around effortlessly with her toddler but it’s official: I have evolved most ungracefully into the hefty, tired and intermittently groaning, complaining pregnant woman. This means that carrying Tuna and her delicious 12kg has become close to unbearable. I can hardly lean down to pick her up without feeling like my belly is about to explode. So stroller-free option (a) was swiftly ruled out. Walking it is. Come on then, Tuna. Let’s focus on the direction in which I intend to head and achieve our supermarket mission. Tuna is pretty quick, when she is motivated by something further ahead. But today, she was much more motivated by the giant aquarium in the middle of the mall, which was smack bang in the opposite direction to our destination. Let’s look at the fish. She eventually got bored of the fish, so I held her hand and led her towards the elevator. Boom. She veers off to the left to look at the butterfly ornaments in the display of another shop. We shall look at the butterflies. At this point, I’m getting impatient. All my pro-efficiency tendencies are itching to take charge of the situation and hurry things along. But then I stopped myself and asked myself – why? What’s the rush, actually? Like really. We have a clear 4 hours ahead of us. Why am I so desperate to get things done so quickly? Maybe I need to take a page out of Tuna’s book and stop and smell the fish and butterflies. Is it because I’m used to working in 6-minute blocks of time thanks to the billable-hour model? Has the need for efficiency, and being able to attribute every 6 minutes to a productive and valuable (read: chargeable) activity permeated my being to that extent? So I slowed down. 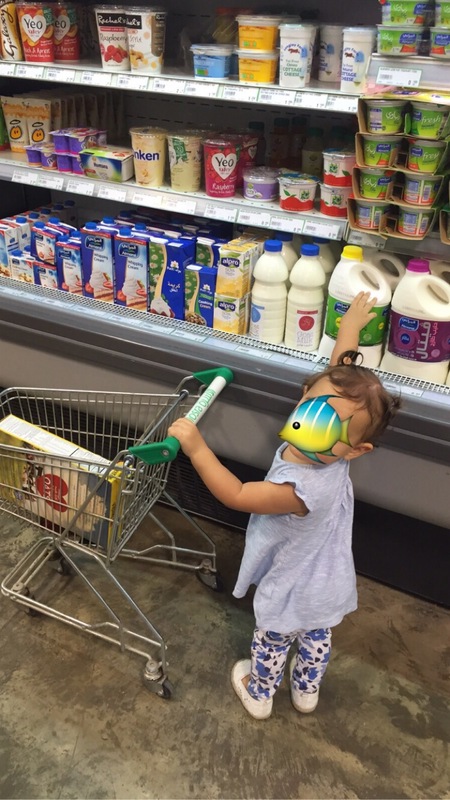 When we ultimately reached the supermarket, I let her take her time in the aisles and play “stocktake assistant” (don’t worry, I tidied up after her and rearranged everything very efficiently – I’m not going to be that parent). Yes, Tuna, we will examine every item that takes your fancy in the grocery aisles. We will say “look, baby!” with so much glee and excitement over and over again, because, you know what, those babies on the diaper packets are pretty goshdarn cute. We will get really fascinated by the various bottles of milk and juice in the refrigerator section and comment on how cold they are. We will make a toddler joke and grin and say “ouch…hot!” instead, because we’re pretty proud that we’ve learned the difference between the two. I just can’t guarantee that I’ll order only “a cappuccino please” the next time I visit a cafe. Old dogs, new tricks. You know how it is. « Co-sleep? More like no-sleep. Shopping with a toddler in tow is hard enough but being pregnant at the same time? Hats off to you for even managing it without breaking down into tears of frustration. Not that I break down into tears of frustration when Lilly is being difficult… not always anyway 😛 Currently I’m attempting potty training and it is insanely frustrating! You are so right Alyson! I totally agree!